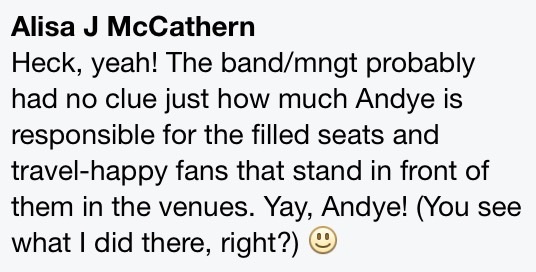 Compliments from Carolyn, thank you! 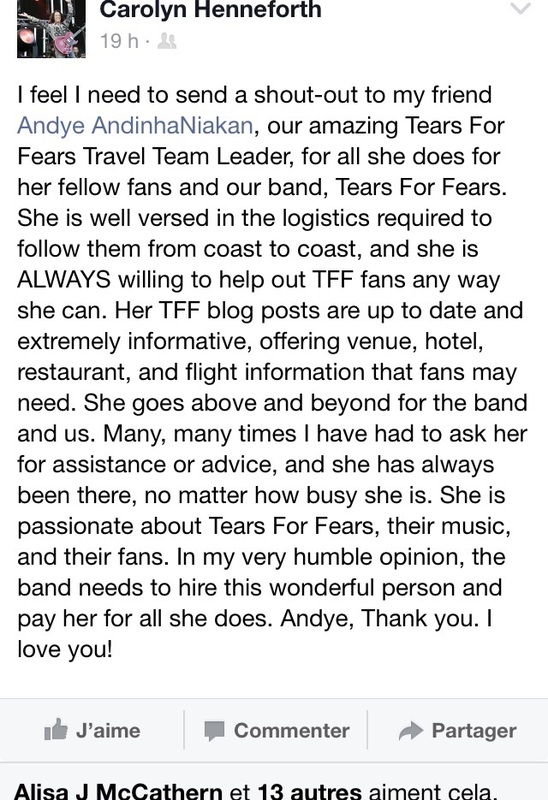 Dearest Fellow TFF Followers, Tears for Fears Travel Fans and friends! It’s Andye here with a little love note to you all! I want to first thank all of the readers from around the globe. Over the summer, SK and I sat in L.A. and took a good look at the stats. We were well over 35,000 visits with people checking in from all over the world including parts of the Middle East, several nations in Africa, Italy, you name it. That is very encouraging and very helpful in our goal to provide information to all interested parties. We get a lot of thank you notes from fans for providing the info and I appreciate each and every one. But be sure to pat yourselves on the back because none of this is possible without the slew of 70+ registered travel fans who come out to shows year after year. We can’t always go to the same show together but where one person can’t go, another will, bringing the Tears for Fears Travel Fan spirit to the forefront. Because our band fan activities have been mainly at shows, I’d personally like to take it up a notch and expand our gatherings (there’s so much more we want to do and host). Still, I’m grateful for the progress we’ve made in getting more people to concerts, sharing extra tickets and now doing larger carpools and spending more time together in person and online. Thank you from Alisa. Big Hugs to her! I have a list a mile long of contributors. 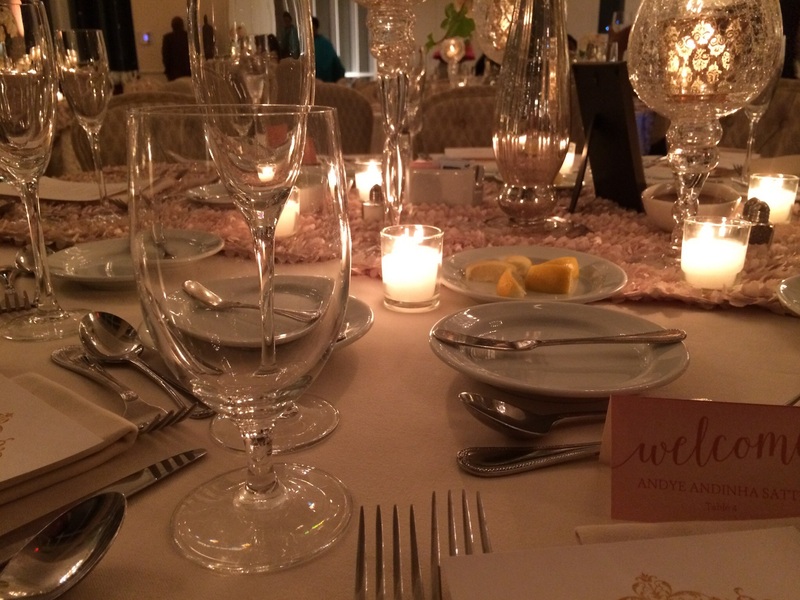 All of the names mentioned in this blog, from Carri and Becky to Alisa and Rise, SheeShee, Lady J and Lady K, plus CH and Jenny WBDA are to be thanked. Each person has gone out of their way to make this group fun and exciting. The band has been very generous with their time, their families have been very sweet and tolerant plus we’ve experienced great responses and outreach from the venues and hotels like Loews Santa Monica who provided us an incredible 500+ sq ft suite overlooking the ocean in 2012 during Brit Week. Boy did we put on a performance out there on that patio in our Curt Smith tshirts and swimwear. Sometimes you just have to be there to see it. We’re just incredibly grateful. These are memories to last a lifetime. There’s been a lot going on over the last 3 months, some noticable and some unnoticed. Carolyn is right, we are doing this as volunteers. We are not on anyone’s payroll and have not requested to be. We are human and have challenges like most. For example, a few of you know I’m attempting to organise fan travel and juggle local challenges. So, yeah it’s a bit much. I may not be able to do a whole lot of parties and gatherings at the moment but I trust that fellow fans will step in and help each other get to and from shows this year. Meanwhile, we’ll do what we can to get any info we receive on upcoming shows, airline deals, etc. If you are having a hard time getting to a show or just don’t know the first thing to do, feel free to send us email through our FB Travel Fan page or send us a tweet on twitter. We’ll do whatever can. We are not “exclusive” so there is no initiation or crazy requirement to be a travel fan. If you show up, contribute a story/photo and have genuine love for the band you are in. Come by at shows (or if you see us in the lobby) and say hello, we are open to taking selfies/usies that can be posted to the blog to show everyone’s participation. The goal is to promote the awesome fun that Tears for Fears (Roland, Curt and Team) provide at shows; dancing and swaying in front of the fans. #ItsAllAboutTheBand! 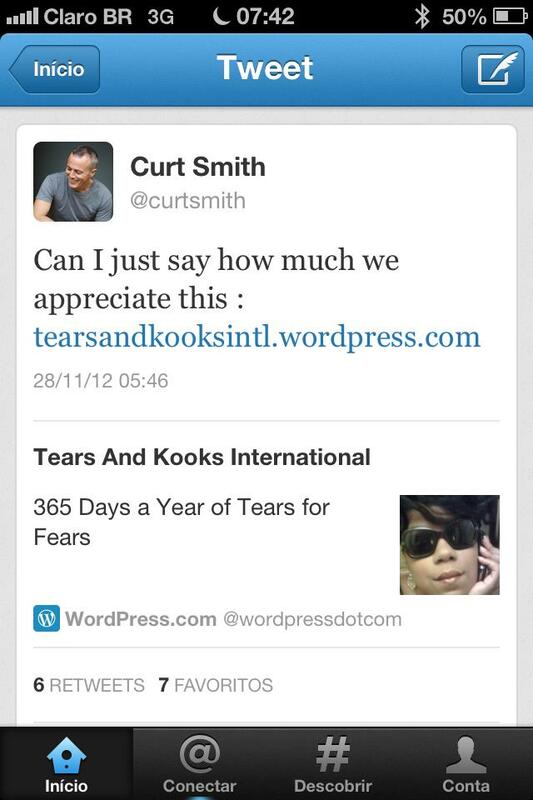 Posted on 29/03/2015 24/04/2015 by International Business and Cultural ExchangePosted in Fan Travel Resources and Tips, Superfan Etiquette -What we learned from Curt Smith, Tears for Fears Regional Fan Club News & Online Fun, Verification/Approvals, Welcome to the Tears for Fears Fan Travel BlogTagged All Our Love for Tears for Fears, Concerts, Curt Smith, Roland Orzabal, Tears for Fears, Tears For Fears Fans, Tears for Fears Travel Fans, Travel.